Product prices and availability are accurate as of 2019-04-11 02:44:53 EDT and are subject to change. Any price and availability information displayed on http://www.amazon.com/ at the time of purchase will apply to the purchase of this product. StarCraft II: Wings of Liberty is the sequel to Blizzard Entertainment's 1998 hit StarCraft, which has been hailed by players and critics worldwide as one of the top real-time strategy games of all time. 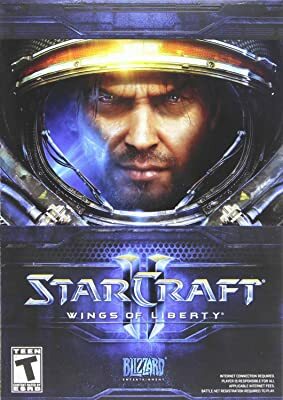 StarCraft II will once again center on the clash between the protoss, terrans, and zerg, with each side deploying favorite units from the original StarCraft, along with numerous upgraded and brand-new units and abilities that allow for fresh tactics and strategies. The game's new 3D-graphics engine maintains the speed and responsive control of its predecessor while rendering hundreds of units onscreen for massive battles. StarCraft II: Wings of Liberty's solo campaign will continue the epic saga where it left off in StarCraft: Brood War. The storyline chronicles the exploits of marshal-turned-rebel-leader Jim Raynor and features both familiar faces and new heroes. Players will be able to tailor the experience, choosing their own mission path and selecting technology and research upgrades to suit their playing style throughout the 29-mission campaign. Several challenge-mode mini-games will also be included, with focused goals designed to ease players into the basics of multiplayer strategies. In addition, dozens of multiplayer maps will be available for competitive play through the new version of Battle.net, which is launching alongside StarCraft II: Wings of Liberty. This new version of the service has been built from the ground up to offer an unparalleled online play experience, with new features such as voice communication, character profiles and achievements, stat-tracking, ladders and leagues, cloud file storage, and more. Additional Requirements: Battle.net registration and Battle.net Desktop Application required to play.